Look for signs of process inefficiency or imbalance such as long queues, long wait times or large work backlogs. Also, look for underutilized functions and work cells. Areas that go for long periods without work are also indicative of a process that is out of balance. Interview key process participants. Ask what they do and why they do it. Ascertain what information and other inputs are needed to perform each task. Identify the source for each input. Identify the outputs (or deliverable parts) of each task, who the recipients are and why they need what they receive. Conduct group interviews and brainstorming sessions. Use group sessions to validate and refine the information you’ve received once you’ve gathered initial information about a process through one-on-one interviews. This is an excellent way to clear up misconceptions of individuals within the process. Summarize the information you have received and distribute it to the process participants. This should include both participants you have interviewed and others that you did not interview. Ask for feedback. Create a process flowchart (also known as a process map). The cross-functional flowchart format is particularly helpful for visually presenting a multifunction process. Flowcharts may be prepared manually or with the use of a chart creation program. Word processors and spreadsheet programs with charting functionality may be used. Programs designed specifically for the purpose of drawing flow charts are particularly well-suited to the task. Divide a page into a series of rows, also referred to as “swim lanes.” Label the top row “Inputs” and label the bottom row “Outputs.” Label each of the other rows with a function that performs one or more tasks in the process. Enter each task in the row labeled for the function that performs that task. Enter inputs to each task above the task in the “Inputs” row and list the outputs of each task below it in the “Outputs” row. Note that the output of one task can often be an input to the next task. Connect inputs, tasks and outputs with arrows to show the direction of process flow. 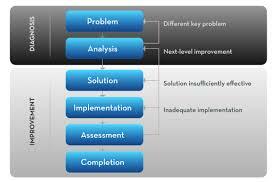 Analyze the Business Process Requirements. Perform task analysis. Evaluate the activities performed in each task: Are the activities efficient? Are they all focused on meeting the task objective? Compare the results from individual interviews. Look for inconsistencies. For instance, does one step in the process deliver something to the next step that is not used in the next step? Identify activities and task outputs that are unnecessary. Sketch the business process from scratch based on the business process requirements identified during interviews and brainstorming sessions. Compare this process flow with the flowchart of the existing process. Identify potential process changes based on your comparison of the current process flow versus the process flow derived from requirements.